It is essential for a bed and breakfast owner to have a good relationship with a plumber, as the last thing you need is for a heating or water problem to cause problems for guests. Clients who can't get hot water for a shower are unlikely to come back and those who get soaked as a result of a leak you will never see again. With a B&B being a business that relies heavily on repeat business and personal recommendations, that is crucial. There are three main aspects to plumbing: central heating and boilers, hot and cold water supplies to appliances, baths, basins and showers, and dealing with waste water from guttering and toilets. In this respect a bed and breakfast is really no different to an ordinary house, although of course there'll be a lot more pipework and junctions as you are likely to have a bathroom for each bedroom. The one major difference between a house and a bed and breakfast is that you have to be careful not to have the hot water too hot, as elderly or very young guests might inadvertently scald themselves. Unlike electrical work almost anyone can do plumbing jobs as far as the authorities are concerned, with the exception of working on gas boilers, particular the connecting and disconnecting to gas services. This must be done by a CORGI approved plumber. Can a B&B Owner be a Plumber Too? It's worth assessing which of the three main categories of plumbing that you are capable of dealing with yourself. The guttering and drainpipes are pretty straightforward, for example, but many people don't like working up on high ladders. Boilers and central heating systems are much more complex, but for some people find them easy to work out and deal with. Most bed and breakfast owners become very adept at fixing minor problems with plumbing in the same way as they do with many other aspects of household maintenance. Certainly there are regular maintenance jobs that can be done on all the aspects of plumbing that will help keep your costs down. 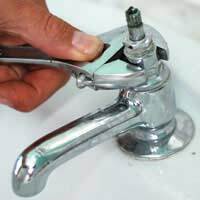 Firstly you can do them yourself so you save the cost of getting a plumber in and secondly you will find early warning signs of impending disaster. This means you can get a plumber in to fix significant problems before they become worse and affect paying guests. If you're new to the area then ask around for references to find a plumber. The local board of trade, chamber of commerce or tourist association, if you are in a tourist region, should be able to put you in touch with a number of reliable professionals who will have worked for other B&B's and hotels. If that doesn’t yield results, ask other bed and breakfast owners who they have used in the past. Another tactic to find a plumber for a bed and breakfast is to check with the plumbing associations directly. They will be able to provide a list of accredited plumbers in your area, or often they take out an advert in the yellow pages which lists their members. Make sure you check any plumbers' credentials and qualifications too, a professional won't mind being asked. When you have a number of candidates, ask each one to come round and look at your bed and breakfast and its plumbing systems. Ask them what they would watch out for, what might cause problems, and how much they would charge to give everything an annual checkout. Try to see at least three candidates and see how well they respond to you and whether or not you think you could work with them, as ideally you will be looking for a long-term relationship. Crucially you need to find out their response times when you have an emergency. For a bed and breakfast owner the result of building a long-term relationship with a plumber is that they will respond as quickly as possible when an emergency happens, and that could be the difference between retaining clients and losing them.